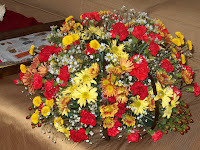 This is an arrangement I did myself many Thanksgivings ago to give as a hostess gift. I started with a wire pumpkin frame that many use for a candle, put in some floral foam and started filling up! 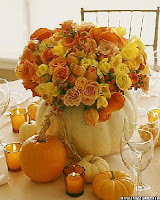 The hostess could then use the pumpkin frame after the arrangement had died off. 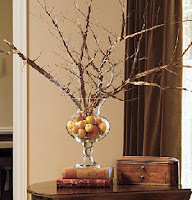 This one from Country Living will last all through the fall with minimal cost (maybe replace the apples every few weeks)... so simple, but a HUGE impact!